The Beneteau Oceanis compared to the Scarab jetboat (below) shows the diversity of design across Groupe Beneteau. When Christophe Lavigne arrived at Four Winns 12 years ago to head the engineering department, the Cadillac, Mich.-based company had a traditional office layout with designers, architects and engineers separated in cubicles. Lavigne changed that, installing what he called the “brainstorming table,” a 25-foot-long collaboration area. The home office in France encourages the same approach. Groupe Beneteau CEO Hervé Gastinel wants collaboration, within and across different organizations, to become a pillar of its global corporate culture. Collaboration suits Lavigne well, who studied engineering in France and, after college, took a job with Jeanneau working on sailboats. He moved to Canada to work for Doral Boats, where he was in charge of engineering. After 12 years, he relocated to the United States to work for Genmar, eventually heading product development for Four Winns, Glastron, Wellcraft and Scarab. Lavigne has overseen the evolution of all four brands. Four Winns is moving from traditional sterndrive runabouts and cruisers to outboard boats, including a Vista 355 scheduled to launch at the Fort Lauderdale International Boat Show. The Four Winns name remains popular in the Great Lakes and northern areas, and the company is looking to make inroads in the Southeast. “The challenge for us as a company is to design a boat that’s compatible for both propulsion systems,” Lavigne says. Glastron, known for sporty bowriders, is also moving from sterndrives to outboards with a series of deckboats targeting Southern markets. 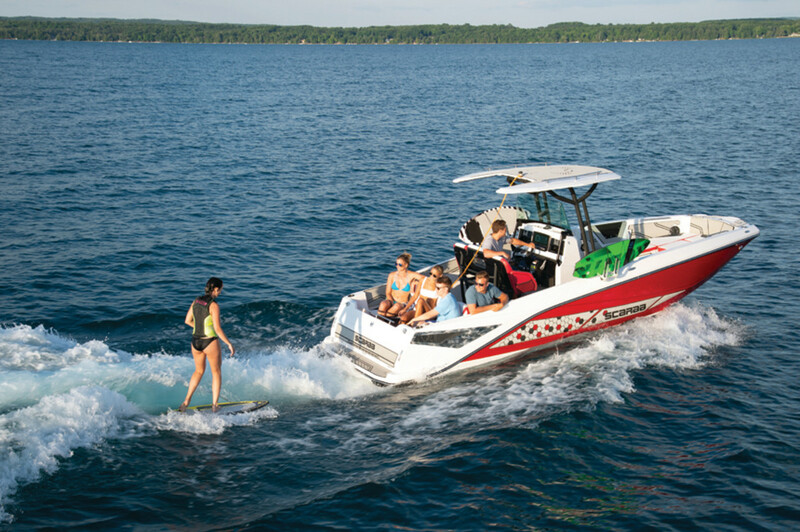 Lavigne says Glastron and Four Winns also are developing wakesurf boats with ballast, speed control and Volvo Penta’s Forward Drive propulsion system. Scarab is offering a surf package, as well. Lavigne says the current line of jetboats continues the Scarab performance lineage. “The brand means competition, agility and speed,” he says. “We have been true to the name in that regard. There is just no real demand for the traditional high-speed, super-cool Scarab of the 1980s and 1990s. The Scarab line is designed for an American customer, with no thought of the European market. Lavigne says that even though he works for a corporation based in France, he has to think and design boats with a North American mindset because 80 percent of the U.S. brands’ business is in North America. “When people in Europe buy a Four Winns, a Scarab or a Glastron, they are buying a piece of America,” he says. At the Michigan facility, the company is building two outboard pocket cruisers for Jeanneau, the NC 795 and NC 895. The plant has five-axis routers, CNC machines and 3-D printing capabilities, and it uses what Lavigne calls “squish molding,” in which there are two molds with resin and fiberglass injected between them. The molds are compressed, or squished, by pressure, distributing resin evenly through the part. It’s an alternative to resin transfer molding that delivers a part that’s finished on both sides. It’s also more environmentally friendly. Such technology has helped to halve boat-design time, Lavigne says, also crediting software improvements and designer skills. The company has developed immersion goggles that position a designer “in the boat” so he can see what he’s working on. On the materials side, the facility is working with lighter, stronger foam cores, carbon fiber and adhesives such as Plexus. “We glue more and more, and screw less and less,” Lavigne says. 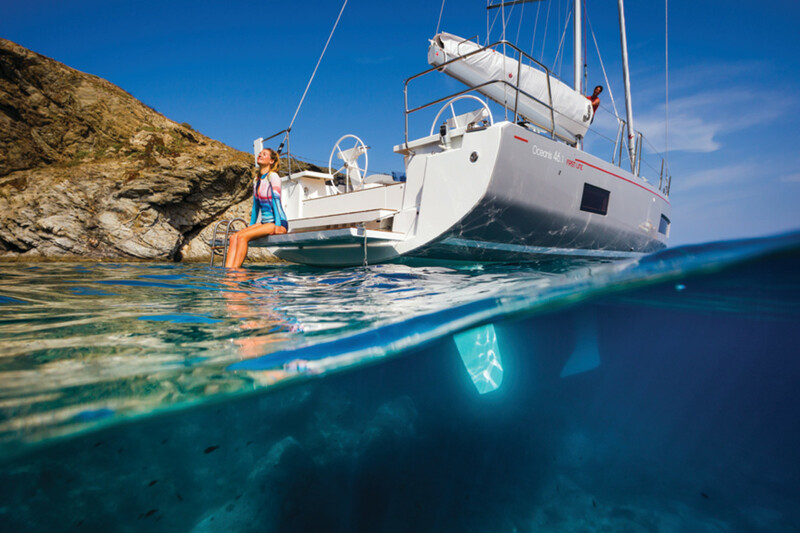 The group has a central research, design and technology facility in France where engineers from Beneteau, Jeanneau and the other brands develop engine installations, rigging, plumbing and other systems. The engineering center also determines the best equipment, such as bilge pumps and blowers. “When we find the best bilge pump, we buy them by the thousands,” Stromberg says. Prestige has a 25-person design team. A project manager will stay in place until a boat is finished, but other team members move around as needed. Prestige’s design area, like the one in Michigan, is an open space that encourages collaboration. “The design philosophy is to play on the strength of our brand, the seaworthiness, and blend the practical sense of a seaworthy boat with Italian design,” Stromberg says. The brand is designed for a global market to achieve the group’s international sales goals. 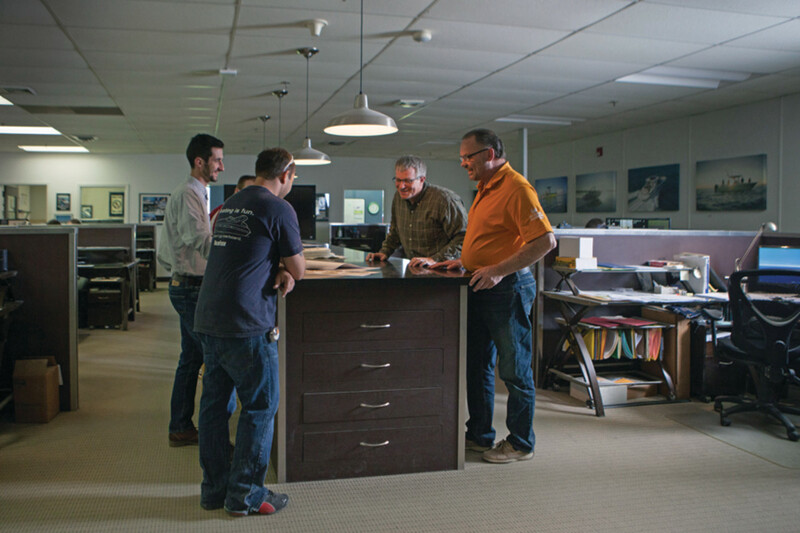 The Prestige design team works on a five-year product plan. Any model expected to debut in three years is considered to be in active product development. Prestige is currently doing a design brief on a 65-foot yacht. After the brief stage, the plans will go to the design team and exterior design partner Garroni Design of Genoa, Italy, before going to management. Once the project gets the green light, Prestige will conduct a feasibility study before prototyping it. Stromberg says the current trend toward larger boats with owner-operators should top out around 70 feet. Innovations will come from the household and automotive markets, he says. At the forefront is connectivity. At the “brainstorming table” in Cadillac, engineers, naval architects and customer service personnel gather to share ideas. Designer Christophe Lavigne’s baseline rule is that boats from 20 to 27 feet should get the same performance from an outboard rated for 50 hp less than a sterndrive. The positioning of the centers of balance and gravity and the fuel tank play a key role in achieving this goal. Boats are designed with the stringers to have multiple configurations for propulsion systems and for the fuel tank to be positioned accordingly. Because an outboard — and its weight — is positioned far aft, the fuel tank is moved forward or aft to ensure that the boat is properly balanced. One design evolution is that a boat might use an outboard with a longer shaft mounted on the trailing edge of a swim platform. It used to be that it was almost automatic to use as short a shaft as possible to achieve optimum performance. That’s not the case today. — E.C.